Danny trials riding in Munich, June 2012. Having seen Danny's riding, I'm not sure whether he's going up, down, sideways, backwards, forwards, or even right side up. Heck, for all I know this is a top down shot of a sidewalk! Pretty trippy picture. I think this looks 2-D almost, but I'm diggin that effect. I'd faceplant so fast if I tried this, and I don't even know what would come after that. Looks like he's up pretty high! looks like realistic trial bike game sorta deal. Its a fraud. He is actually laying down on some pavement. Never been so stoked on a POD. Colors, angles, lines. One of my favorite bike photos I've ever seen. It would be ironic if he had no skill. Otherwise its coincidence. You... don't know who that is? He is one of the greatest trials riders on the planet. I knew I liked you for some reason Hooly, big CG fan over here. I was seriously gutted when I heard that he was out for the season with such a bad injury. sick trick! love the lines!!! Sick.. It took me some time till i realized he`s steezin it on a fence or sth like that. Danny having the word "skill in his last name just makes this picture twice as good! Sweet POD!!! Took me a while to find it but here is a different angle picture of what he is riding. Now the question.. wich way he is going ? UP ? Down ? It is a pure expression of a man and a bike both doing something they were never supposed to be able to do. 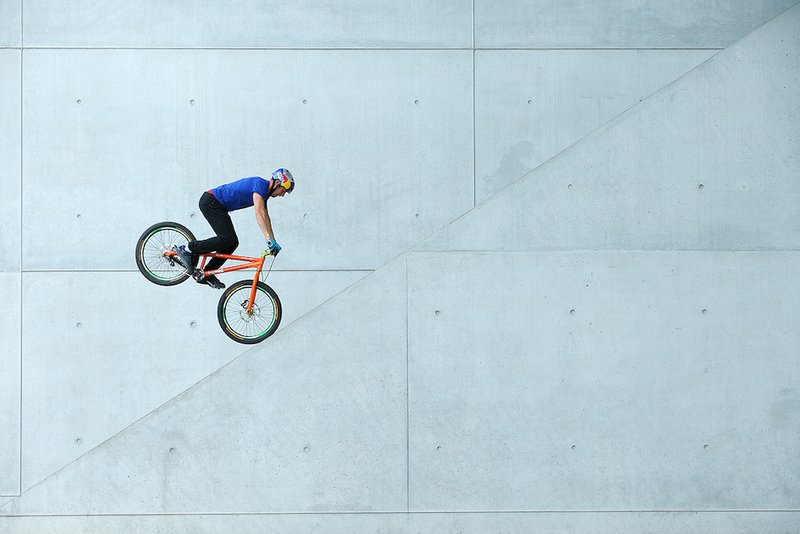 Sure this is street trials, but that ideal extends to every discipline of biking. When you and your bike pull off something normal people and bikes cannot do, you have pushed the sport. I thought I would be cool and put some rigid forks on my hardtail. Sooo cool I thought, until I rode it and couldn't even bunny hop up a small curb. those got taken off quickly.... damn. I hear ya. I built my DJ bike with a rigid fork at first and was learning trials, then I made the mistake of giving it 4" travel... Couldn't jump any more after that. I'm guessing that this is the hand rail and there are stairs just on the other side, so he is riding on a strip of granite only so wide. Wildness!! flip your screen to the side then upside down then to the side then to the other side then upside down then to the side then upside down then to other side........ nope- it still does not make sense........... yep- it still looks awesome! he should have front wheel drive them he could do his trick from down to the top !! It's Danny. Maybe he is. And boom! So stoked on this photo. Love it. The picture was shot in Munich at the "Pinakothek der Moderne" (copy/paste to Google). Well done, I really enjoy the graphic elements to this image! Genuinely one of the best PODs ive ever seen. Reminds me of the Freerider video game. Its a geometry equation i cant figure out..
From the Thumbnail I thought it was a drawing. I love this composition. This shot would be awesome on a wall. Are those 180mm rotors on a trials bike? i like the way the geometric figures dont fit each other. its like the they're supposed to fit but they don't. WOW!! This is what I call skills! looks like a folded piece of paper in the thumbnail. awesome. DAAAANNNNNYYYY!!!! one of my fav riders! sweet, did someone say POD? this guy is like god! fair play that looks sick! very nice shot, definitely POD worthy. However I think Danny Mac is going to have to step up his game after seeing Martyn Ashton.. I find it disturbing that I cannot figure out his direction. The shot is not giving away any details of the environment either. Somenone please help? ahh!! but did he do a forward nose manual up the hill first to get the position where he started his backward nose manual down the hill? It's a pretty fast run in with a kind of bunny hop up on to the ramp. Danny carried his speed as much as he could up the ramp then just at the transition from forward to reverse motion when gravity takes over he lifted the back up and rolled back down on the front. He started the move a little higher but this position slightly lower had a better composition, I felt. It's great to capture Danny through the lens on some of the classic architecture spots in Munich. This one did take a lot of commitment and he worked hard for it.